Kids today benefit so much from technology, but sometimes it’s important to take a break. Image courtesy of Mireille of Mireille’s Journey to Health. Editors note: This article is by Mireille from Mireille’s Journey to Health. I highly encourage you to read some of her great posts. Technology is advancing so quickly. We are able to do more than ever. We are living in the digital age. Our kids are growing up in it. The things they are able to do on a computer are amazing! It’s so natural to them. At the same time, it seems to be consuming so many of them. According to www.childrenstech.com, there are over 40,000 apps for kids! It seems wherever I go, I see kids playing on tablets and phones. I truly feel that kids will benefit from their exposure to technology. It’s going to be a huge part of their future. However, in addition to being able to tap the screen on a tablet or phone, they need to function in the real, physical world they live in. Play time needs to consist of more than tapping a screen or moving a joy stick. They need to be up and moving around playing, without a screen involved. They need to be able to entertain themselves without having a phone or tablet to play with. So many kids feel like they need to have digital entertainment at all times. It’s crazy! Whatever happened to imagination and creative play? It’s hard to set ground rules, especially with so many grey areas, such as educational apps. I’ll be honest, my 6 year-old studies his spelling words with an app on the iPad. It seems to be the most effective way we’ve found for him to study. I’m definitely not opposed to them using the tablets and the phones. Technology is advancing fast, and what better way to keep up with it, than to grow and advance with it! What they need to find is balance, so they are not consumed in this digital, technological era. I’m not going to recommend or support anyone’s recommendation for a maximum amount of time kids should be exposed to technology each day. Each child is different. Each day is different. Be aware of how your kids are spending their time, what they’ve accomplished that day, and their overall attitudes. Homework and chores should always come first. Kids should have time for active, imaginative, creative play, as well. There are no one-size-fits-all, hard rules. You know your child better than anyone. 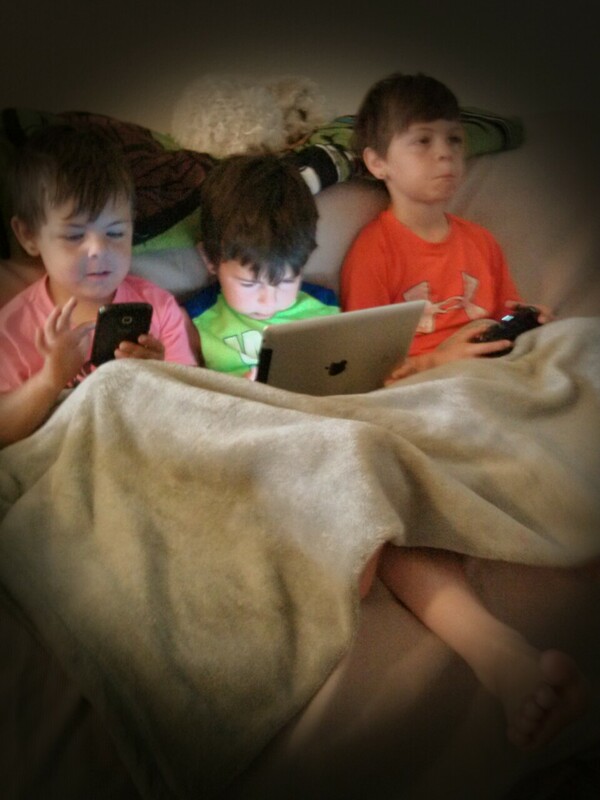 If they seem to be consumed by the “tech world,” have them take a break for a few days. Take them to the park. Draw together. Have them help make dinner. Make it fun, not like a chore. Build a fort. You see what I’m getting at, right? Do something fun together. As parents, it’s easy to hand a tablet to our kids to keep them busy so we can do what? Work on our computer, check things on our phone, or play Candy Crush. Perhaps, your doing real work or getting laundry done. It’s still so important to find time to teach our kids how to play and be creative, even in a digital world.